The nagara or nagada is a drum with a rounded back and a hide head, usually played in pairs. It is thus a membranophone of the kettle drum variety. The term naqqarat, naqqarah, naqqåre, nakkare, nagora comes from the Arabic verb naqr- that means “to strike, beat”. The rounded section of a naqqara is made of baked clay, while the flat side consists of treated skin fastened around the rim with string which is tightened over the back of the bowl. 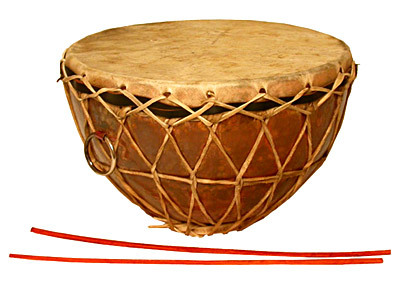 This percussion instrument is often played in pairs, where one naqqara will produce low pitch beats called nar and the other for the high pitch beats. The instruments are beaten with short wooden sticks bent outward at the upper ends called damka. Naqqārāt is the name of kettledrums in Arabic countries. Naqqārāt, hemispherical with the skin stretched over the top, come in pairs. Naqqarat is one of the percussion instruments used in Maqam al-Iraqi chalghi ensembles. Under the late Abbasids and the Fatimid Caliphate, kettledrums were beaten before the five daily prayers; small ones form part of present-day orchestral ensembles. Naqåre-ye Shomal “northern naqqåre”: played in northern Iran. Its native name in Mazandaran Province is desarkutan. Desarkutan is in fact a pair of small drums whose bodies are made of clay. Their structure is like that of a bowl. One is larger than the other; the larger is called bam and the smaller one is called zil. which respectively mean “bass” and “treble”. The diameter of the bam is about 22 cm and the diameter of the zil is about 16 cm. Two drums are covered by cowhide, though in the past boarhide was used. The skin is tightened on the drums by bands made of cow tendon. Desarkutan: played with two wooden drumsticks. The length of the drumsticks is 25-27 cm. The thicker drumstick is used to play on the larger drum. The diameter of the drumsticks is 1-1.5 cm. Serna, the Mazandarani oboe, (Dari Persian sorna) is accompanied by one or two sets of desarkutan. These instruments are played in festive ceremonies such as wedding ceremonies, sport ceremonies and so on. Desarkutan is not used as a solo instrument. Fars naqqåre: played in the Fars province of Iran is a little larger than ordinary naqqåre. Sanandaji naqqåre: played in the Sanandaj city of Kurdistan province of Iran is a little larger than ordinary naqqåre. Naqqårekhån: Khåne literally means “house, home, room, place” and in Iran, there were different kinds of naqqårekhåne and there were places for announcing important news by playing on the kettledrums such as rising and setting of the sun, victory, mourning, birth of a male baby etc. These were also called Kuskhåne or, in Indian languages, naubat-khāna. Dukar-Tikar, from Nagara genre, are kettledrums which accompany shehnai, an Indian woodwind instrument. Rajasthan. Naqqara are also found in India, where the word is pronounced nagara or nagada. They are paired kettledrums traditionally used in the naubat “Nine Things”, a traditional ensemble of nine instruments. Nagara are also played with sticks. Today, this instrument is usually used to accompany the shehnai or “Indian oboe”, an indispensable component of any North Indian wedding. Rebecca Stewart’s unpublished thesis, The Tabla in Perspective (UCLA, 1974) has suggested tabla was most likely a hybrid resulting from experiments with existing drums such as pakhawaj, dholak, and naqqara. In Azerbaijan there is a kind of kettledrum that is called ghosha-naqara. Ghosha means “pair”. In Turkey, this word is pronounced nakkare and refers to small kettledrums beaten with the hands or two sticks. Kös, or giant kettledrums played on horseback, are a separate instrument. These drums and the davul or cylindrical drum were used in Ottoman mehter music. In Uzbekistan the kettledrum is called naqara or nagora. Dulnaqara: a large kettledrum that gives a low and loud sound (i.e. “tum”). Reznaqara is a small kettledrum that gives a high and loud sound (i.e. “tak”). Koshnaqara is a small-paired kettledrum, a pair of clay pots with goatskin tops. Kettledrums in Europe today are called tympani or timpani. They entered the symphony orchestra as a purely musical instrument in the mid 17th century; they were played in pairs tuned to tonic and dominant pitches. Ludwig van Beethoven was the first composer to vary the tuning of kettledrums from the conventional tonic-dominant. Hector Berlioz was possibly the first to require a change of tuning during a single movement. Béla Bartók made use of the glissando, which is a rapid slurring effect created by mechanical tuning of the kettledrum. This is a widespread percussion instrument all over Georgia. It comprises two small cone-shaped clay pots (jars) of the same height, but different width, which are covered with leather. One of the clay pots is smaller than the other. A cord ties the two jars together. The height of the jars is 200-250 mm, and their diameters are 90mm and 170mm. The diplipito is played with two small sticks called “goat legs.” The instrument is used to provide rhythms for vocal music and dance music. It is often combined with instruments such as duduki, buzika panduri, and salamuri. The diplipito is generally played by males, and plays an important role in Georgian folk ensembles.